Produced by Intima Virtual Base - Institute for Contemporary Arts, Slovenia, 2006, in collaboration with Maska and Cona. Special thanks to Bojana Kunst, Irena Pivka, Shankar Barua, Bacchus Barua. Project supported by The Ministry of Culture of the Republic of Slovenia. Oppera Internettikka Bollywooddikka was performed live at the India International Centre in New Delhi, in the frame of CeC & CaC - The Carnival of e-Creativity & Change-agents Conclave, presented by The Academy of Electronic Arts and The India International Centre, on 28 January 2006, and broadcast live on the internet. CeC - The Carnival of e-Creativity is organised by the producer, curator and director Shankar Barua. 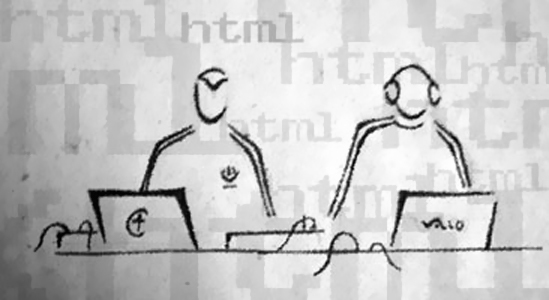 I. Štromajer and B. Zorman were singing and manipulating HTML source code of the www.bollywood.com website, as it was written on 15 August 2005, on the Indian Independence Day.